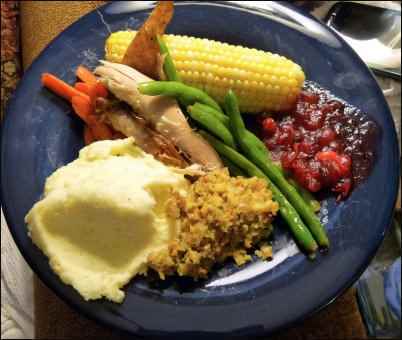 Turkey Day… or Should It Be “Corn Day”? Home /History/Turkey Day… or Should It Be “Corn Day”? I admit, I am very pro-Thanksgiving. What’s not to like? On what other holiday can we get together with family, spare a turkey life, eat til we scream, and avoid pesky rituals like annoyingly themed canned music at the mall? You don’t have to buy presents, sing special songs, or endure (quite as much) media blitz—mainly because Thanksgiving has been pretty much lost in the shuffle towards Christmas, in fact, nearly trampled underfoot by Santa and Rudolph as merchants zealously push to get you prepared for December 25th, starting around November 15th. So Thanksgiving is blessedly quiet, a time reserved for the religious to be as religious as they like, and others to enjoy without hoopla. Thanksgiving for most Americans equals two days off work, some once-a-year great chow, maybe a football game streaming on the screen of your choice, and a good sound snooze. Now that’s tradition. For these reasons, Thanksgiving could be considered the best American holiday. And it could be thought of as our first international day of reconciliation and multi-cultural interaction. 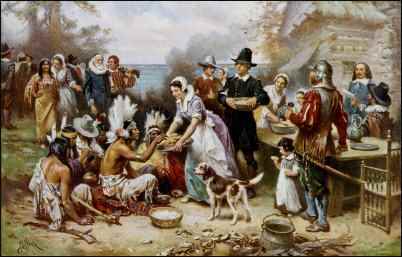 The First Thanksgiving 1621, by Jean Leon Gerome Ferris (1899) shows common misconceptions about that first gathering persist even today: Pilgrims did not wear such outfits, and the Wampanoag are dressed in the style of Native Americans from the Great Plains. The Pilgrims (who were some religious people fleeing from the evil English King who would not let them go to the church of their choice) landed on Plymouth Rock somewhere up north, one cold foggy day in 1620-something after 60+ days of being stuck on a tiny wooden ship. They worked for months building houses and growing crops, but winter was coming, a lot harsher than winters back in England. The otherwise heroic, clever Pilgrims didn’t know what food would grow well in this new place, so they asked the local friendly Indians to help. The Indians—a tribe called the Wampanoag, who wore feathers and carried tomahawks (that they peacefully did not use)—showed the Pilgrims how to grow corn, and that saved the Pilgrims’ bacon. So, when harvest time came, the Pilgrims and the Indians had a big feast together and thanked each other and God for keeping them safe. And that was the beginning of Thanksgiving. But we are not in third grade anymore. So now perhaps some of the stars are out of our eyes about the Original Thanksgiving, which, by the way, has been attributed to other colonists than those who arrived on The Mayflower, at different times. Similar confusion surrounds the exact initiation of Official Thanksgiving, for the feast enjoyed by the Pilgrims and the Wampanoag was not repeated, and to the settlers, would not have been considered anything other than a secular bash, not unlike a good old night at the pub—there would have been feats of strength, demos, and the singing of merry, not sacred, songs. The Pilgrims, who actually referred to themselves as “saints’ (meaning that they were among the elect of God) didn’t even believe in celebrating Christmas, so they did not attach themselves to a yearly ritual of thanks giving, either. The first government-decreed thanks day was agreed upon by the Continental Congress in 1777, during the American Revolution, presumably with the idea in mind that if we gave enough thanks, we might get God on our side against the redcoats. The proclamation that contained this enigmatic clause: “And it is further recommended, That servile Labor, and such Recreation, as, though at other Times innocent, may be unbecoming the Purpose of this Appointment, be omitted on so solemn an Occasion.” I’m still trying to figure that one out. George Washington was the first President (well, he would have been, wouldn’t he?) to proclaim our own national day of thanks, on Thursday, November 26, 1789. But this was again a one-off celebration, and other leaders either did, or did not, follow up with their own days of “Public Thanksgiving.” In fact, it should be noted that Thomas Jefferson eschewed the institution of Thanksgiving as bringing church and state dangerously close to each other. So the American “thanksgiving day” was sporadic for some years, until Abraham Lincoln ordained one that seemed likely to stick, designating the final Thursday in November as a yearly commemoration. Even in the midst of the Civil War, Abe honestly wished to acknowledge “the blessings of fruitful fields and healthful skies,” and by listing such silver linings as could be perceived during a time of grave national crisis, perhaps to unite his people in an exercise of renewed hope and will to do the right. Lincoln’s designated day lasted until Franklin Delano Roosevelt became irksome when confronted a November in which there were anomalously five Fridays. Apparently not willing to wait so long for his stuffing, he stuck his fork in for Thanksgiving to be held once-and-for-all forever-n-ever on the fourth Thursday in November. The fact that this meant that every year we would have to consult our calendars to get the date right did not bother FDR; he decreed and we agreed, and since then his proposition has suited our disposition and seems—probably—unlikely to change. U. S. Presidents, who can’t, of course, be seen in ordinary supermarkets, are given turkeys from the official farms of the National Turkey Federation. Turkey pardoning was made official by George W. Bush, but the tradition had started informally before that time. President Kennedy, for example, informally pardoned a big bird possibly feeling it was too large (55 pounds) to be very flavorful, and President Reagan pardoned a bird as a kind of ironic joke after being pestered with questions about a pardon for Oliver North who was being grilled for his part in the Iran-Contra scandal. The National Turkey Federation raises the “pardon” turkeys. Pardon turkeys have to be well-fed, in fact, over-stuffed, and not camera-shy. Every year, 80 specially chosen birds are glutted with turkey food and given special privileges in anticipation of possibly being the pardoned turkey. Only one will make the, well, the un-cut. Sadly, pardon birds are pretty unhealthy, becoming grotesquely obese in the line of duty, and prone to develop the same ailments that many obese humans do, so though they are not slaughtered for food, their cosseting usually results in a short life span. Being an American farm-raised turkey does not offer a hopeful prognosis for long life. But, for Thanksgiving, unless you are vegetarian, it’s gotta be the gobbler. The National Turkey Federation statistics indicate that Americans eat 46 million turkeys at Thanksgiving each year (as compared to only a puny 22 million at Christmas). Why? Why the need to consume a specific bird? No one tells us what kind of cake we must have for a birthday or whether to eat chocolate or real eggs at Easter, or suggests that we must put candy in a trick or treat bag when we would rather add a healthy apple. So why have we fixated on the T-bird for the T-day? It’s time now to look at the menu for the day of thanks enjoyed by the Pilgrims. From time immemorial, human beings have celebrated the harvest time. In the waning year, it seemed wise always to propitiate the gods of darkness by offering fruits of the farming year. Thanksgiving is a holiday that, like many others, serves double duty—a worldly feast and a chance to remember the creator of the corn. Corn for the Mayflower passengers was a salvation—many had died in the first year, and failing to have a reliable crop was not an option if the great experiment in freedom from monarchy was to succeed. In heading across the Atlantic, the early settlers were unknowingly turning their backs on barley, rye, and other grains as a dietary mainstay. They might not worship the Corn Goddess as did many in the New World, but they were certainly grateful to their deity for those first ears of maize. So why did we not fixate on the corn kernel, instead of the big feathered fowl? We are told by various historical experts that the “first” New World Thanksgiving meal would have consisted of all manner of birds (swans and pigeons are mentioned)—one man who actually attended the Plymouth fest reported “as much fowl as…served the company almost a week.” These were stuffed with onions and herbs, bread of the English sort being unknown and cornbread not being a Native dish. Deer was served, and native fruits and veggies like grapes, melons, and leeks. Less palatable, but obviously abundant, would have been eels and shellfish. Cranberries, yes, are mentioned, though one wonders how they were prepared since a person can just about perish of starvation on a mono-diet of the very acidic berries. Root crops like turnips were available. Chestnuts, walnuts, and beans were there, and pumpkins. Pies unlikely since, as mentioned, there would have been no dough. And though the pilgrims were puritanical, they were not averse to having a bit of grog with meals, as long as no one was toasting—yes, because toasts are wasteful of good grog. We can see how, through the past, nearly 400 years, the cuisine of Thanksgiving has retained some of the flavors of the first—if it was the first—thanks giving day, or three days. We make chestnut dressing, and most American households have pumpkin pie, and if not cornbread, perhaps corn stuffing for the Big Bird. With a sharp knife, slit each row of corn in the center. Then shave in the thinnest slices. Add the corn to the yolks of the eggs, next the butter, cornstarch, sugar, and salt, then the milk, gradually, and last of all the whites. Bake in a hot oven. As soon as a light brown on top, cover with a buttered paper. Grate cracker or bread crumbs over it…say a word of thanks… and serve.